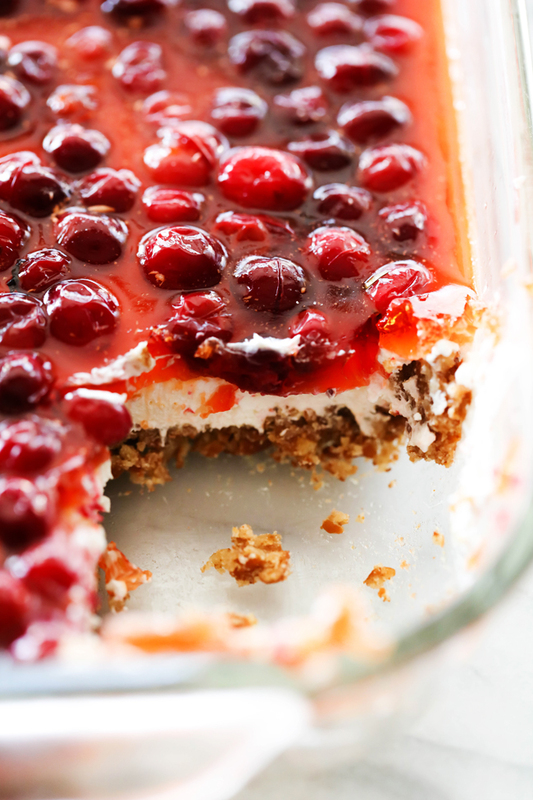 This Orange Cranberry Pretzel Jello Dessert is a delicious and gorgeous holiday treat! It is tart, sweet, salty, creamy, crunchy and crisp. With so many wonderful flavors and textures, it will be the hit of any party! During the holidays, the orange and cranberry combo are a must for my family. One of my personal favorites you will find on the blog is the Cranberry Orange Pound Cake. It is FABULOUS! There is also a Cranberry Orange Bundt Cake that is a must try as well. I knew I couldn’t let the holidays pass without doing one more. This Orange Cranberry Pretzel Jello Salad is outstanding. Everyone at our dinner couldn’t stop raving about it and going back for more. 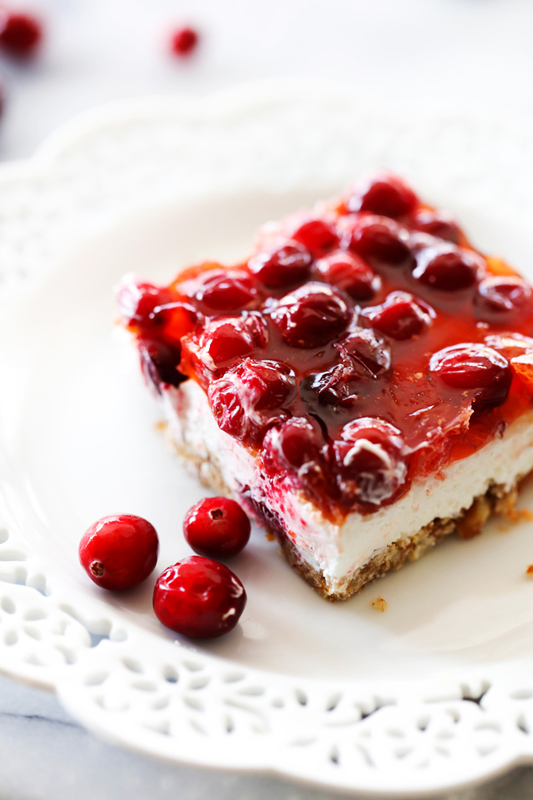 It has a tartness from the cranberry, a fresh citrus flavor from the orange jello, a creamy and sweet flavor from the filling and a salty crunch from the pretzel crust. This dessert encompasses it all. In my husband’s family, jello makes a regular appearance at the dinner table. If I’m being honest, Jello is simply not my thing by itself. HOWEVER, when it comes to pretzel jello desserts (I have a few on my blog) I go crazy over them. Something about pair jello with real fruit, creamy filling and balancing it with a salty crunch crust gets me to gobble it right up. Let this recipe be a part of your holiday dinner table. It is festive and delicious and will be such a popular item. 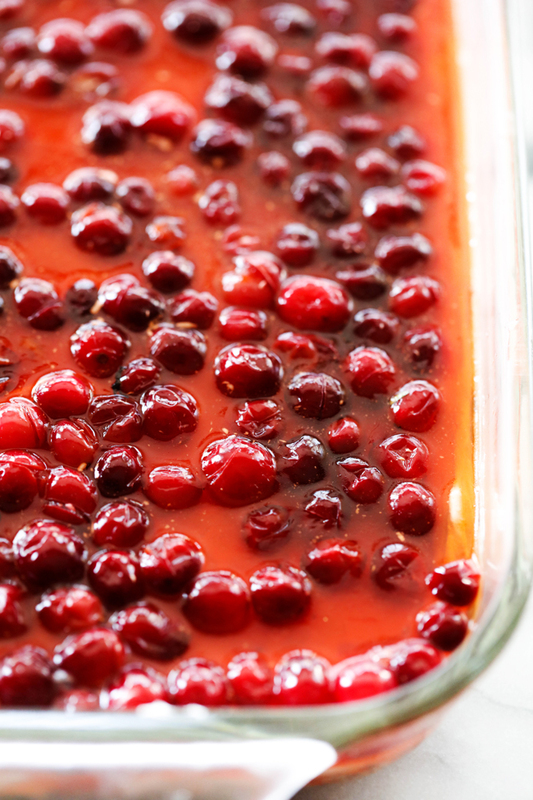 In a medium sauce pan, bring 2¼ cups of water, 1 Tablespoon sugar, and 3 cups cranberries to a boil for 2 minutes. Remove from stove and add jello. Stir until Jello is dissolved. Allow jello to cool to room temperature. Combine melted butter and sugar. Stir in the crushed pretzels. Press evenly on the bottom of a 9x13 pan. Bake at 375 degrees F for 8 minutes. Let cool completely. In a large bowl, combine cream cheese and sugar. Beat until smooth. Next, stir in Cool Whip. Spread over pretzel crust. Make sure to get the cream mixture tight against the edges of the pan to prevent the jello mixture from seeping through. Pour cooled jello over cream layer and put in the fridge for at least 4 hours.